From there, another dialog box will appear that shows your image along with an "OK" button in bright green. There are also options to manipulate the size of your image, especially useful should you want it to display at a smaller size. Note that images larger than the page-width will be auto-scaled to fit. 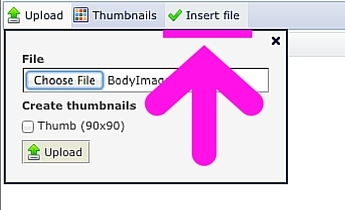 If your image becomes stretched out once you publish your blog post, you can simply click the image to bring that dialog box up again by double-clicking the image in the editor. From there just click on the lock icon so that the width and height are "locked" to maintain image ratio / proportions. Once you click OK, you should see the image in the Body text box of your post. You are now ready to continue writing or add other images.